The following took place on the beginning of the third week in December. We have a family tradition for birthdays that my mom started a long time ago. 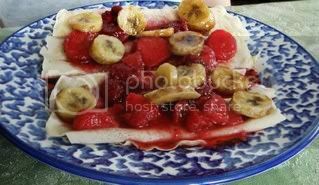 To make our birthdays more special, she started making breakfast crepes. This is my brother's plate (he has the same birthday as I). The crepes are spread lightly but evenly with lovely morello cherry preserves (lovely because it isn't too sweet) and topped with sweetened strawberries and raspberries (we used frozen because December isn't fresh fruit season), and caramelized banana slices, which were a great contrast to the sweetness of the strawberries and somewhat tart raspberries. 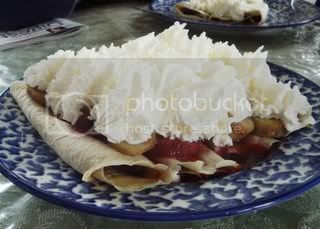 My plate, topped with whipped cream. My brother's plate. He really loads up on whipped cream. 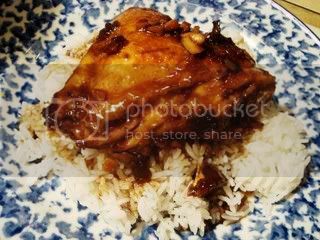 For dinner, my mom made sticky chicken served on a bed of jasmine rice. It's a really quick and simple dish that's full of flavor. She made it a bit differently this time by adding grated orange rind, which gave it a nice orange essence. The cake was my brother's idea. (Normally, two cakes would have been made, but I didn't really care so I opted not to have one. Blasphemy, I know. **I'm rolling my eyes right now**) My brother wanted a chocolate-chocolate banana cake with banana chunks and peanut butter frosting. I used the banana-caramel cake recipe from Martha Stewart's Baking Handbook, but I replaced some of the flour with cocoa powder and added dark chocolate chips. (To digress for a moment, I've since come to realize that adding chocolate chips to a cake batter isn't such a brilliant idea. 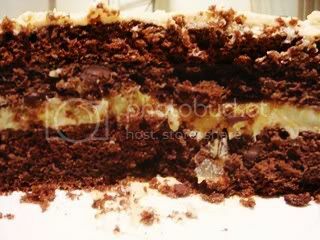 Since chocolate chips are made so they won't lose its shape, having large chunks of chocolate dispersed throughout the finished cake works against being able to cut even slices without bits of cake dislodging from the slice. Mini chocolate chips probably would have been a better idea, or maybe just not using Ghirardelli, as their chips are larger than other brands' and better suited for brownies and cookies.) I did follow the directions for the caramelized bananas, though I cooked mine a bit too long and the bananas were mushier than I intended them to be. I used a different recipe for the frosting, which I thought was too sweet. To cut the sweetness, I added some kosher salt after the frosting was made and folded it in; the sweet and salty combination rocks! Cake innards! If you look closely, you can just see the outline of the caramelized bananas in center. Overall, the cake was lovely and the flavors melded well together. The cake wasn't too dense, and the peanut butter-caramelized banana flavor is a winning combination. But, I thought it was more on the sweet side than I prefer in a dessert, though not sore throat-inducing. 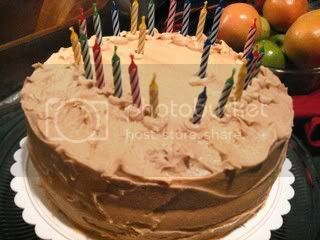 Whatever the case may be, your cake looks so yummy, though I have to agree that chocolate chips don't really have a place in nice moist cakes. At least for me. Looks like you did a wonderful job though! Happy birthday to you! 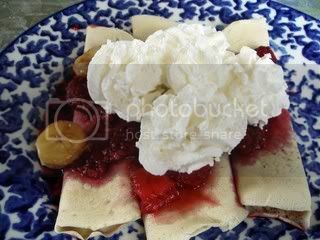 Those crepes look really good. Your brother was too greedy with the whipped cream, though. The cakes looks good, too. I love banana and chocolate together. What great birthday food!! Happy birthday!